Is Théâtre Sainte-Catherine accessible to people with reduced mobility? Yes, of course! 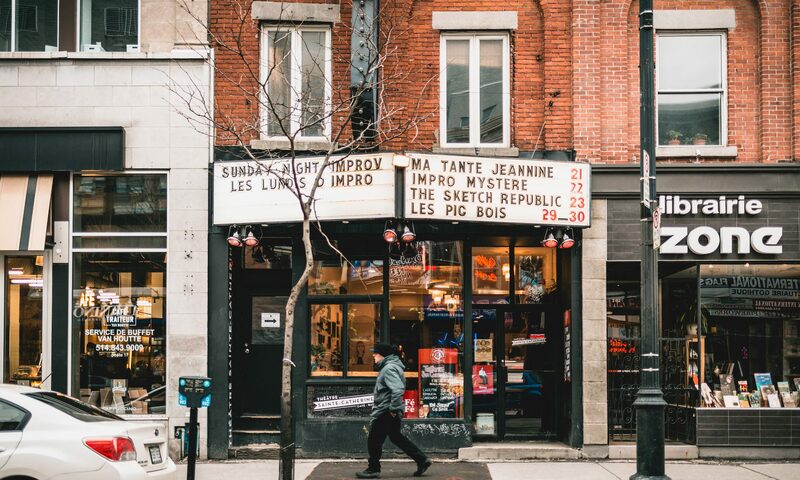 The Théâtre Sainte-Catherine has a street level entrance and an access ramp that we can install for the one step up from the sidewalk at any time upon request. However, our restrooms are small and not equipped with a holding bar, so access for users with reduced mobility is limited. For any specific accessibility request of for more information, don’t hesitate to contact us at 514-284-3939. Are minors (babies, children, teenagers, etc.) allowed in the Théâtre Sainte-Catherine? Minors are welcome in the Théâtre, unless otherwise directed by event organizers. You are held responsible for verifying the age restrictions before attending a show. We reserve the right to see personal identification from anyone trying to purchase alcohol. Any minor who drinks alcohol or uses drugs in our space will be evicted from the Théâtre. Usually, doors open 30 minutes before an event begins. Come and grab a drink in our Café-bar and reserve your spot while waiting in line or chilling up front. There is a strict no-stress policy in the front. All shows that we host are General Admission. That means that no seat is reserved. We suggest that you arrive 15 to 30 minutes before the beginning of the event in order to save your spot. Can we pay with a debit card? And a credit card? We accept cash transactions, debit card payments (no minimum) and credit card payments (10$ minimum). Are there parking spots near Théâtre Sainte-Catherine? Where can I buy a ticket for Les Lundis d’impro? Tickets for Les Lundis d’Impro are available at the door only. Since the event is quite popular, we suggest that you arrive 30 minutes before the beginning of the show (at 7h30pm) in order to reserve a spot. Since we serve food, alcohol and other beverages, it is forbidden to bring food from the outside into our Théâtre.